Are you tired of dusting one day and not being able to tell the next day? 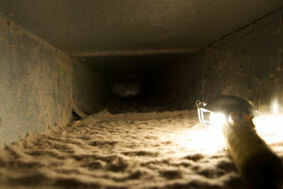 Then you need the pros at Gilliam Power Vac to clean your duct work! Serving Des Moines, Iowa and surrounding areas. Call us at 515-270-0535. 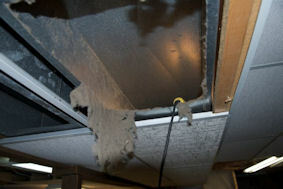 Most of house dust comes from your ductwork system. Every time your furnace blower kicks on dust is shot out of your warm air registers and is drawn across the room into your cold air returns. This is an endless cycle, leaving dust on the furniture and floors on a daily basis. Above are some pictures a customer took and shared with us. His wife had to work and he took them so she could see where all her dust was coming from. This was many years of dust, dirt and debris mixed with pet hair, filing the entire trunk line of their heating/ac system. 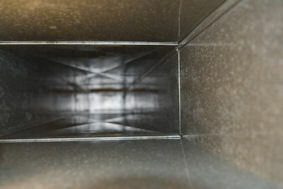 We show you inside your ductwork (using the openings we cut) before and after we do our procedure, leaving you satisfied and feeling absolutely clean. "The difference is like night and day!" "You could eat off this!" "Take a look around our site and see our cleaning method, the products we use and a little more about us. Thank you for your interest in Gilliam Power Vac."